Aksharadhool: Forcing remembrance with a Pianoforte! Forcing remembrance with a Pianoforte! About thirty years ago, I made number of trips over a period of time, to the city of Kolkata for Business purposes. I must admit that I fell in love with that city in spite of its horrible traffic, dug up main arteries(the Metro construction was in full swing then) decrepit buildings and squalid by lanes. Kolkata was a vibrant city with rich Bengali culture. I loved the Bengali sweets and shopping for Kolkata sarees was actually a pleasure. I bought bagful of sarees for a pittance and ladies back home in Pune, just loved them. During one of my visits there, I decided to do some sight seeing and booked a seat on one of these city tours. One of the major attractions of this tour was supposed to be the Victoria memorial hall. Anyone who has seen the grand architecture of New Delhi, Victoria memorial hall, in spite of the efforts and the money spent by the British Raj on it, appears at best a poor cousin of Delhi's Rashtrapati Bhavan and adjoining North and South blocks. The White facade, spacious and well manicured front gardens, are all very majestic and impressive no doubt. While walking through the building I saw many sculptures, statues and huge paintings. Surprisingly the exhibits just failed to enthuse me. Normally, I love to visit museums. I have spent hours in New Delhi's National Museum taking hundreds of photographs. Yet this grand memorial was for me just a huge building with collection of statues and sculptures, with whom I could not connect. Much later, while reflecting on my visit to Victoria memorial, I realized the reason for my lack of interest in this building. Victoria Memorial Hall has no soul. Last year, I made a foray to Humpi, capital of the Vijayanagar empire in Karnataka state. The place, now mostly in ruins, immediately connects you with its history, victory celebrations and days of disaster. Humpi has a soul and you immediately connect to it. In comparison, Victoria memorial hall appeared to me just like a grand Bollywood or Hollywood set, ready for a shoot but soulless. In 1901, subsequent to death of Queen Victoria of England, Lord Curzon, then Viceroy of India suggested that a most suitable memorial to the Queen that would be a "stately", spacious, monumental and grand building, surrounded by an exquisite garden should be built. According to him this should be a historical museum, where pictures and statues of men who played a prominent part in the history of India would be exhibited. Since India was British colony then, Queen of England was naturally De jure Queen of India, forced on Indian people. There used to be a large coterie of princes of erstwhile princely states, who spent their entire life in luxury on support of the Privy purses doled out by the British Government to them. These princes and some other rich Indians immediately responded to this call of the Viceroy and agreed to provide a huge sum for constructing such a building as a solid show of their obedience to the British crown. The total cost of construction of this monument, amounting to 10.5 Million rupees, was entirely contributed by these servile sycophants. Sir William Emerson, President of the British Institute of Architects, designed and drew up the plan of this building, while the work of construction was entrusted to Messrs. Martin & Co. of Calcutta. Vincent J. Esch was the superintending architect. I think that the Victoria Memorial Hall, after Independence in 1947, has not able to find any true bearings at all for itself. It tries to be a museum and a cultural center. I do not know how well it can connect today, either with simple yet forceful Shanti Niketan culture of Rabindranath Tagore or history of fierce Bengali Nationalism of Netaji Subhashchandra Bose, which once spearheaded the Independence movement in India. Possibly, it would remain just a tourist attraction, mainly for British tourists visiting Kolkata, as a fond remembrance of the British Raj. 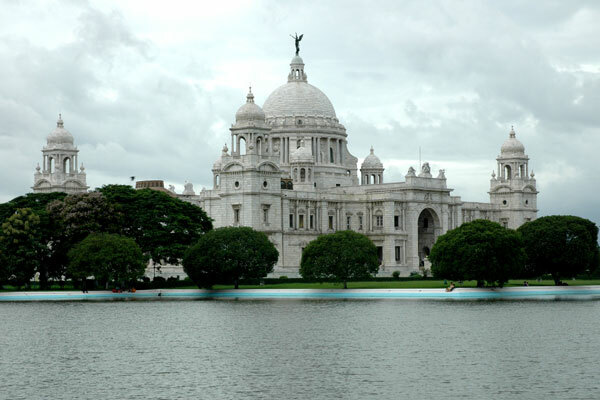 Many of the blog readers might be wondering about the reason for my writing today about Victoria Memorial hall of Kolkata, with which I have never managed to connect. This is because of an interesting news item, that attracted my attention recently. 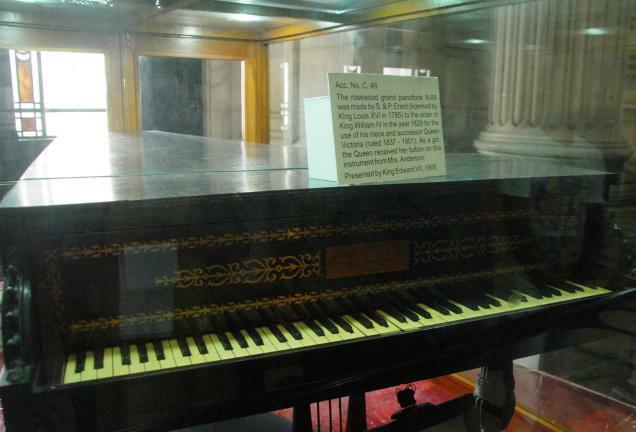 The authorities at Victoria Memorial Hall have displayed a nearly 200-year-old piano that was used by Queen Victoria herself, on the occasion of World Music Day this week. 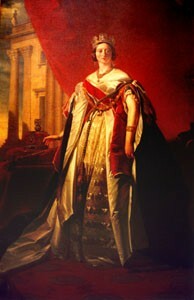 The grand Piano was ordered for the 10-year-old Victoria by her uncle, King William IV, in 1829. Little Victoria learned, how to play it, from her teacher Mrs. Lucy Anderson, according to records kept along with exhibit. A certificate from the French manufacturers of the instrument, S & P Erard, says that the piano (N. 69) was made by them in 1829 “for the use of Her Late Majesty Queen Victoria, when a girl”. 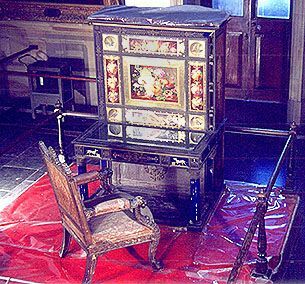 Along with the piano, the writing desk and chair used by the queen for her daily correspondence at Windsor Castle, are also displayed. All these personal effects were gifted to Victoria Memorial by her son King Edward VII. The museum has now renovated a portion that was known as Royal gallery and a new Queen's hall has been created. The Piano is being kept in this room. At the time of unveiling Queen’s Hall, a concert was organized by students of the noted pianist Jyotishka Dasgupta, who played compositions by J.S. Bach, Frederic Chopin and Franz Schubert. The efforts of museum authorities to kick some life in the dull, staid atmosphere of the Victoria memorial hall, are highly commendable no doubt. However it remains to be seen, how much interest this new display can create amongst visitors and in particular, Indian visitors.